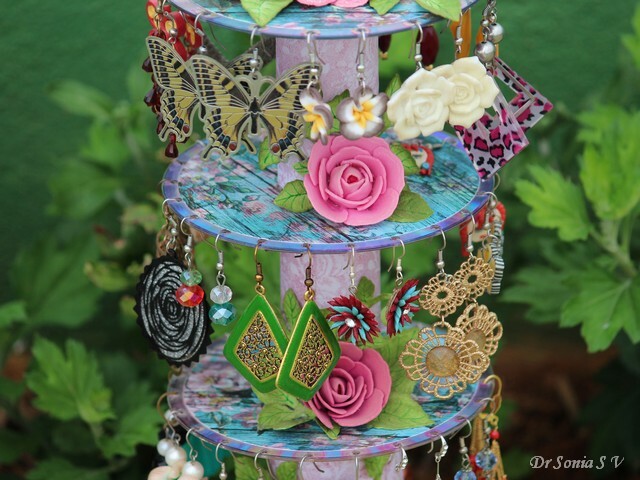 Hi friends this DIY Earring Holder is my final post as Designer Spotlight for Simon Says Stamp Monday Challenge where the theme is "We're Going Around In Circles"
I love to incorporate recycling in my crafts and here I recycled CDs and cardboard tubes to create my earring holders. 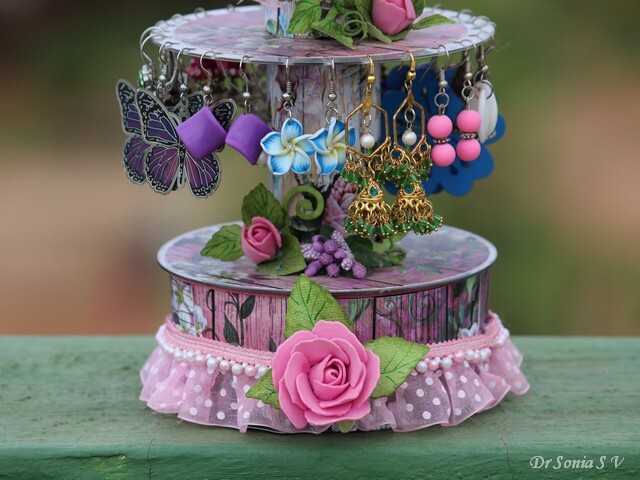 Each layer of this earring stand can hold 11- 13 pairs of earrings and the whole stand can display 30-39 pairs of earrings! Foam is a material I have enjoyed crafting with even before it became the "in thing"!! 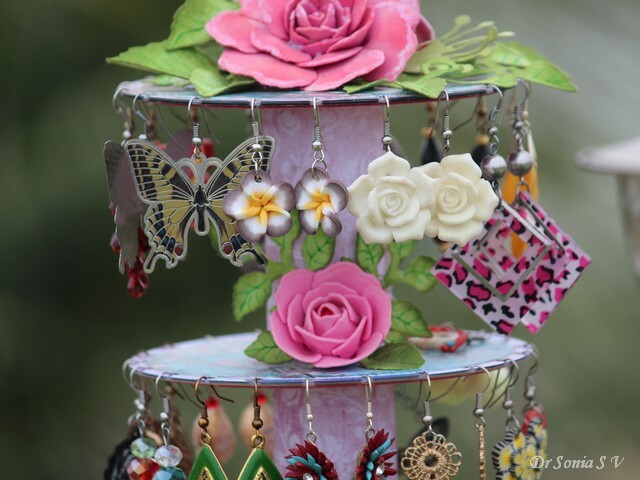 All the roses and rosebuds on the earring holders were made using thin sheets of pink foam and Spellbinders Rose Creations die. 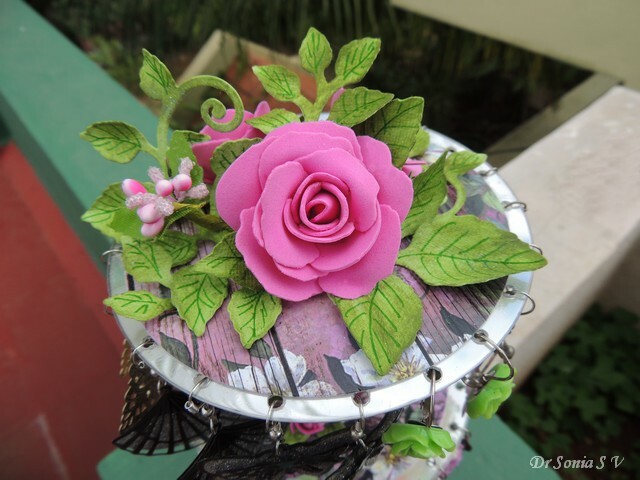 Here are some of the Tutorials to make the foam roses : Handmade Flower Tutorials. 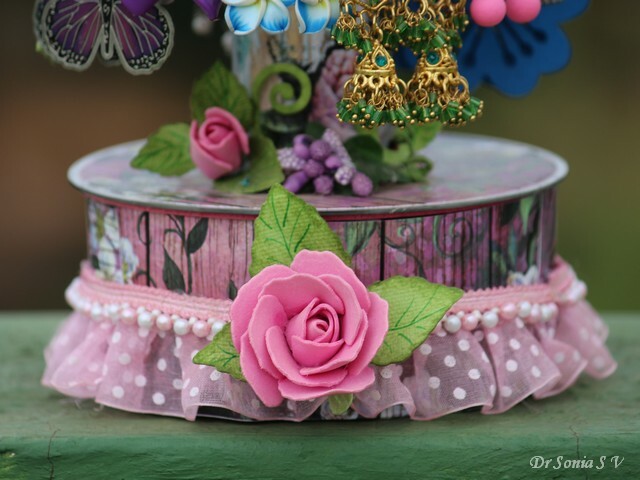 You can adapt most paper flower Tutorials to make foam flowers ...the main points are to use thin sheets of foam and to use hot glue as the adhesive. 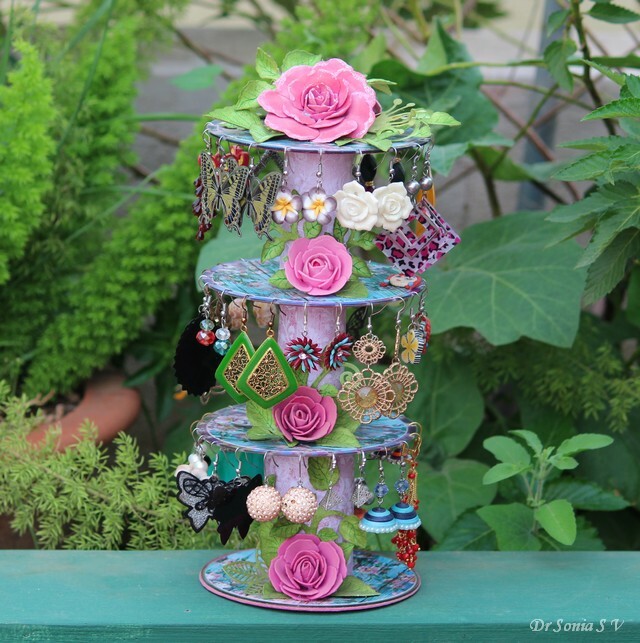 Before I made this stand I used to store my earring in Ferrero Rocher boxes...it was okay but I had to go through stacks of boxes to get to a earring I needed...this way the earrings are clearly displayed and dangle so prettily! 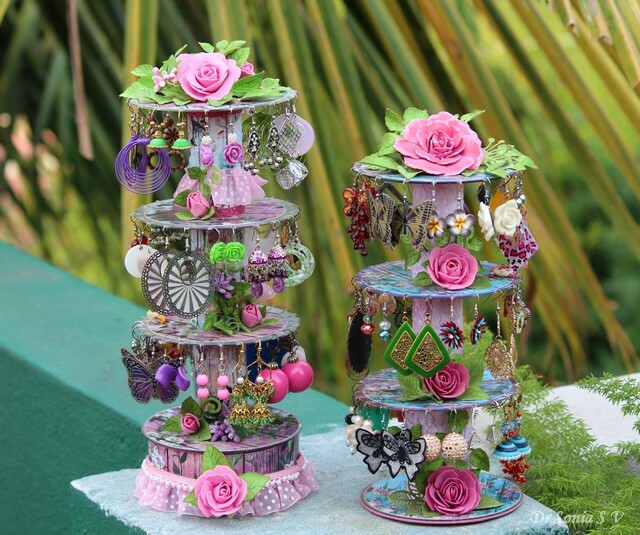 CDs- though you may be tempted to use other materials for the layers, CDs are the sturdiest and easiest option. I used 4 CDs here. 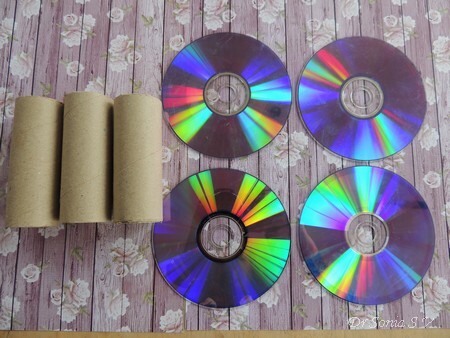 Paper- to line your CDs and Paper Rolls. Adhesive- Liquid adhesive and the Hot glue gun. Something to punch holes in the CDs- You can heat a nail and pierce through the CD but it requires a lot of patience and it can be frustrating! 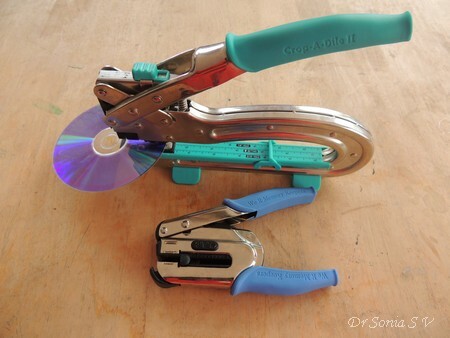 Easiest is to use a Cropadile or a good strong punch such as the WRMK hole punch. 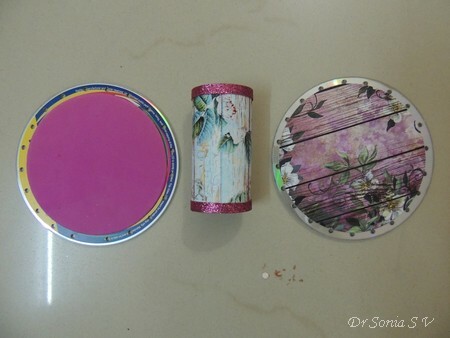 Pretty up your CD with circles of pattern paper cut slightly smaller than the area of the CD. [It is better to cut your paper not to cover the entire CD so that you dont have to worry about strong adhesion at the area where the holes will be punched]. 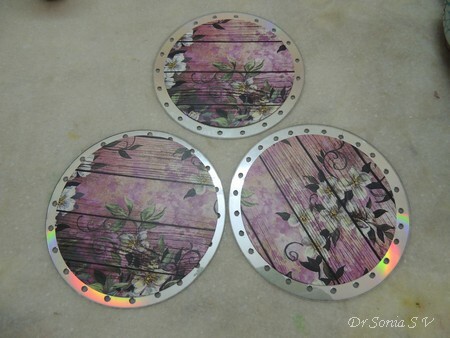 Punch holes in 3 CDs only as the 4th CD will be your base layer and will not hold earrings. Punch holes at intervals of approximately 1/2 inch...you dont need to measure anything just eyeball it! Dont punch the holes right at the edge of the CD...punch 3-4mm inside the outer circumference of the CD. Optionally add a circle of foam to the under-surface of the CD...adding foam and hot gluing the paper roll cylinders to it gives a more secure adhesion! 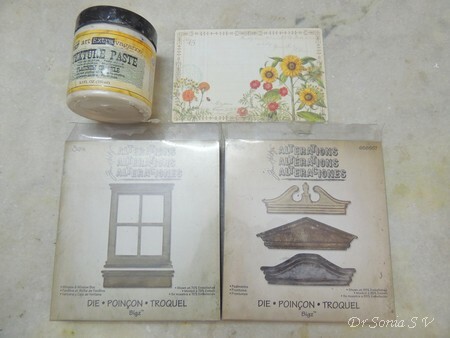 I have used adhesive backed foam sheets which are nowadays available in the market but you can use regular foam too. 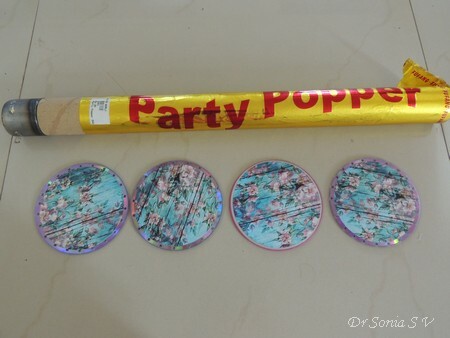 For one of my earring holders I recycled a confetti party popper we had used in my daughter's birthday party. 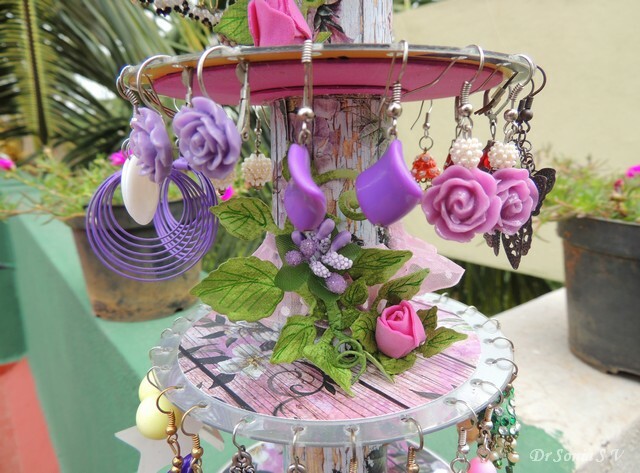 In the first earring stand I made ,I was not sure if the rack would topple over after adding earrings so I created a weighted base using a plastic container. But later on I found out that it was stable and sturdy with just a CD as the base. 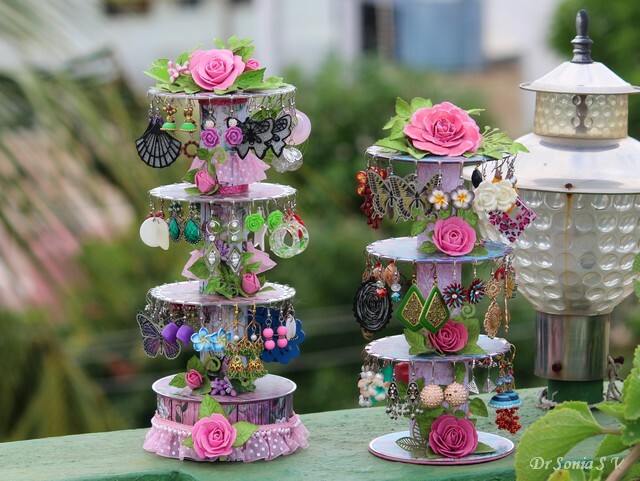 I hope you liked this idea and I hope this will be useful for not only for others like me who have a good collection of dangling earrings but for also talented ladies who make and sell earrings at craft fairs and exhibitions. 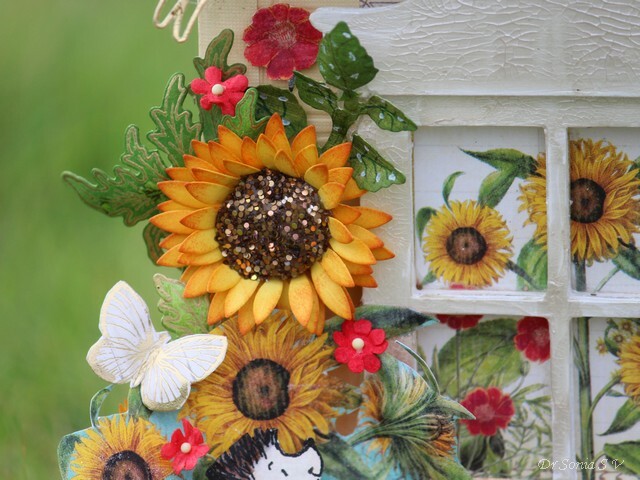 I have had so much fun creating for Simon Says Stamp and I hope you liked my posts as well. 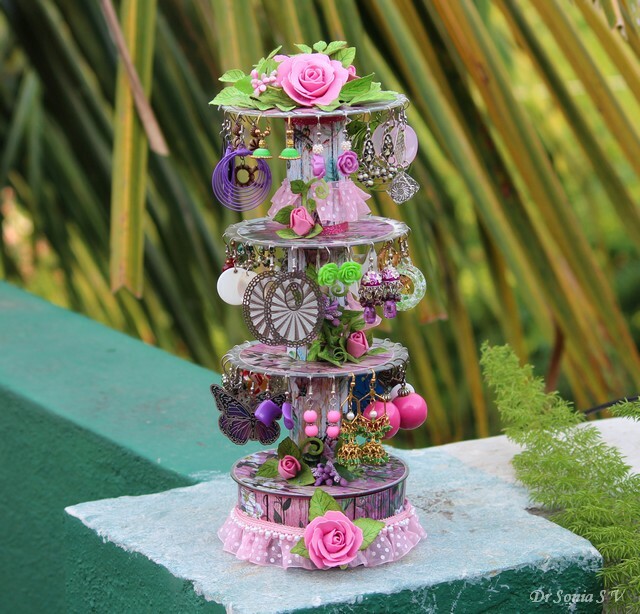 Do drop by the Simon Says Stamp Monday Challenge blog to be inspired by gorgeous creations by the amazing DT and also to participate.You can link in 5 times and you have a chance to win a $50 prize each week! 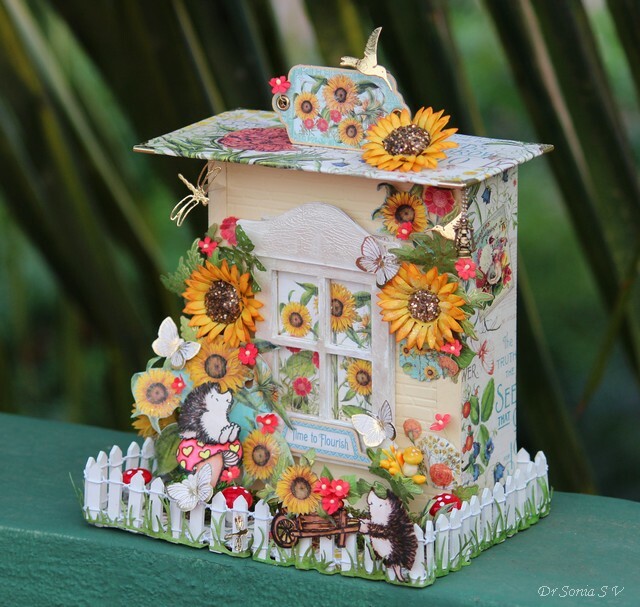 Hi friends sharing a 3 dimensional Garden Shed with Little Critters for my 4th post as Designer Spotlight for Simon Says Stamp Monday Challenge where the theme is "Little Critters"
And I made a 3 dimensional garden shed using chipboard and added cute little hedgehogs, butterflies and dragonflies as critters! 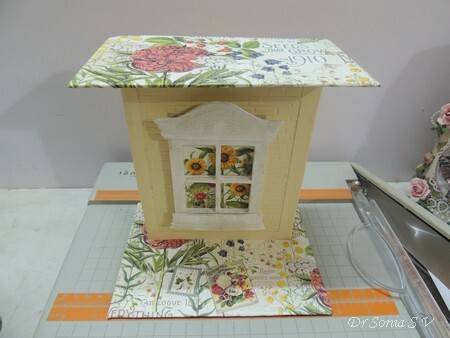 I love to use Sizzix Big Z dies and to create the 3 D window for my garden shed I die cut 3 pieces of chipboard using the Tim Holtz Window and Pediments dies, layered them atop , applied gesso and gave a nice coating of Prima Texture crackle paste . 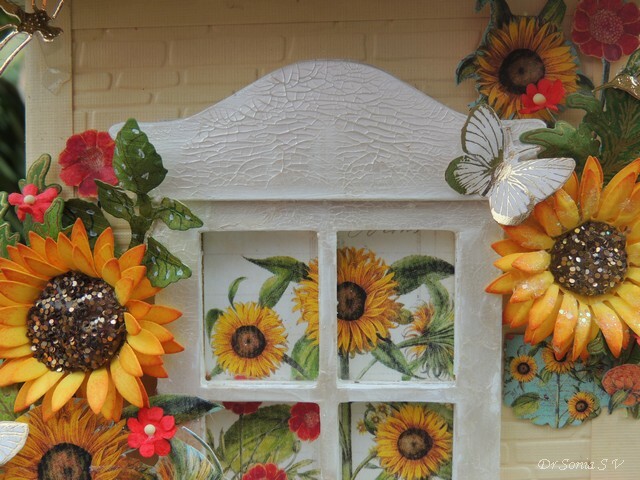 Added Graphic 45 Time to Flourish papers behind and around the window to create a sunny cheerful scene! 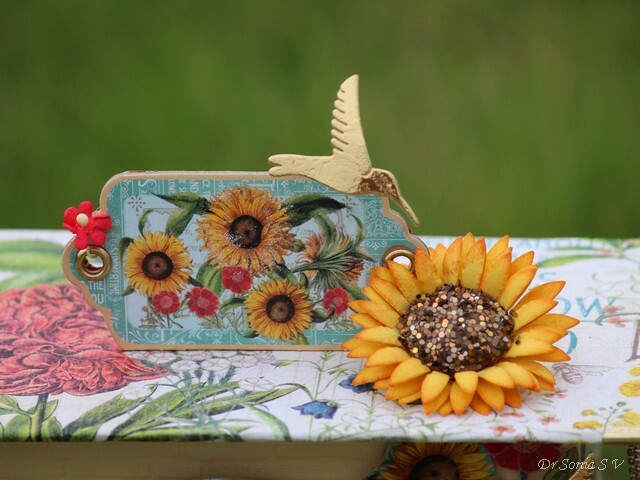 I fussy cut some gorgeous flowers from the Graphic 45 papers and also made matching handmade sunflowers [using the Cheery Lynn sunflower die] . 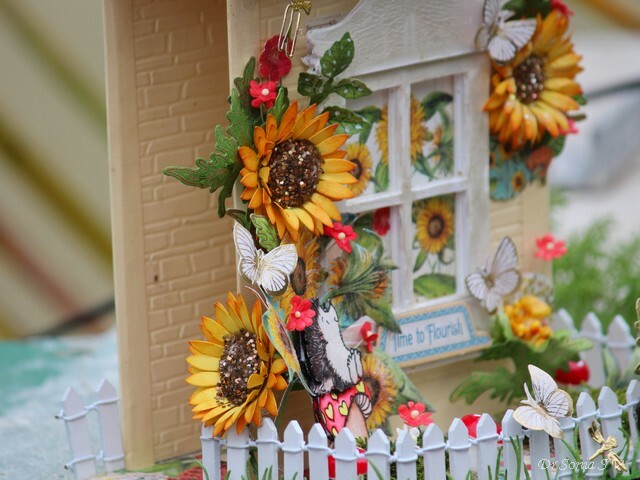 Since the theme was "Little Critters" I added butterflies, hummingbirds and dragonflies to my garden! 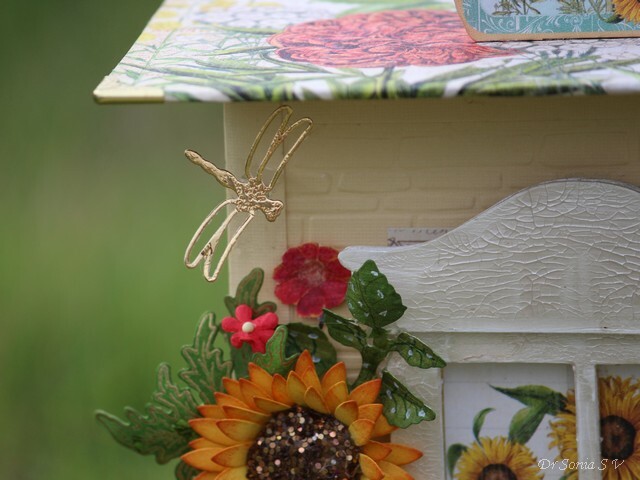 I embossed cream card stock using the Spellbinders Brick folder and added my 3 D chipboard window to the front piece. 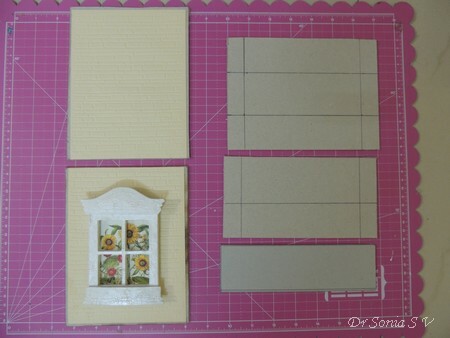 Used double layers of chipboard to create the roof , base and sidewalls. 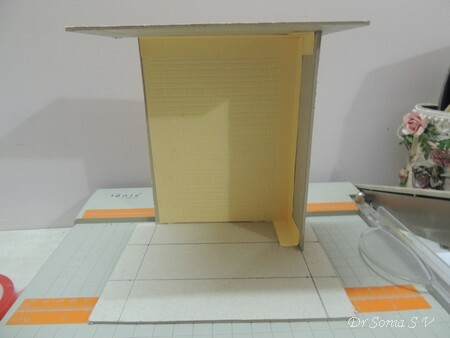 When constructing such a 3 D structure it is easier to stick the roof and base first and later add the side wall. I used card stock and liquid glue to stick the pieces together. 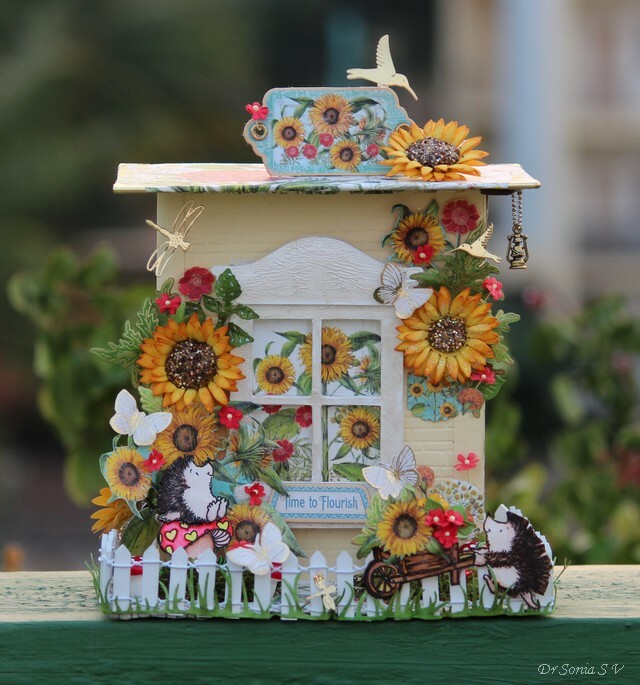 The base and roof of my Garden shed are lined with beautiful papers from Graphic 45 Time to Flourish. 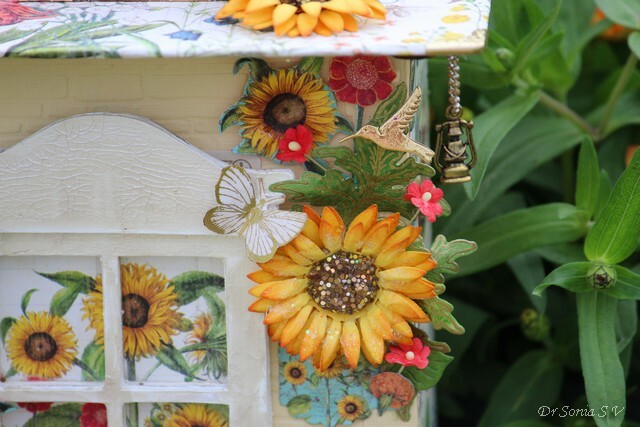 I added a hovering hummingbird on the roof...made it literally hover using acetate!! 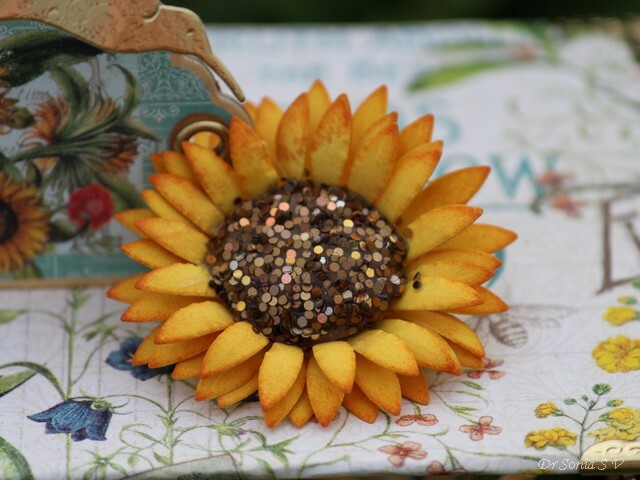 I used rusty hinge and wild honey Distress Inks to create the gorgeous shading for my sunflower and added chunky glitter on the center! I also made the golden dragonfly fly in midair by suspending it using a thin strip of acetate! 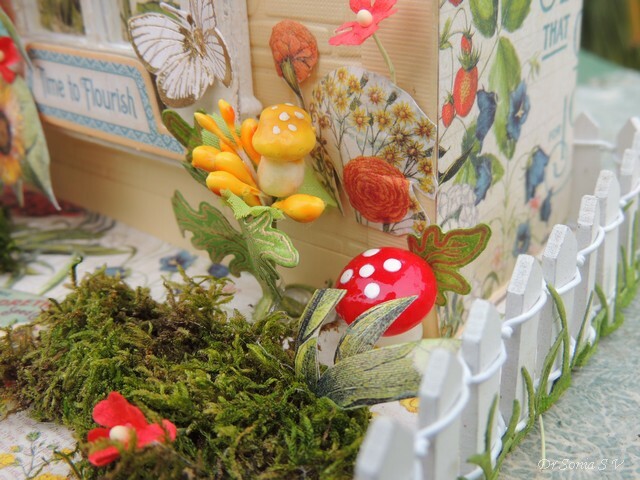 The garden floor has moss and mushrooms! 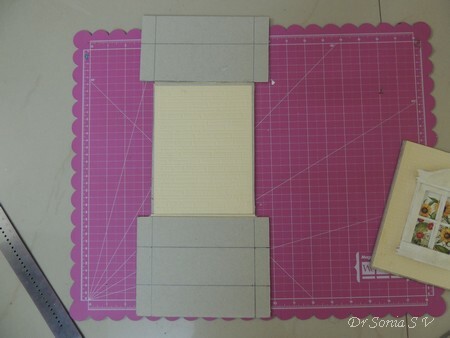 The picture below shows the open side to slip in your mini album or secret diary! 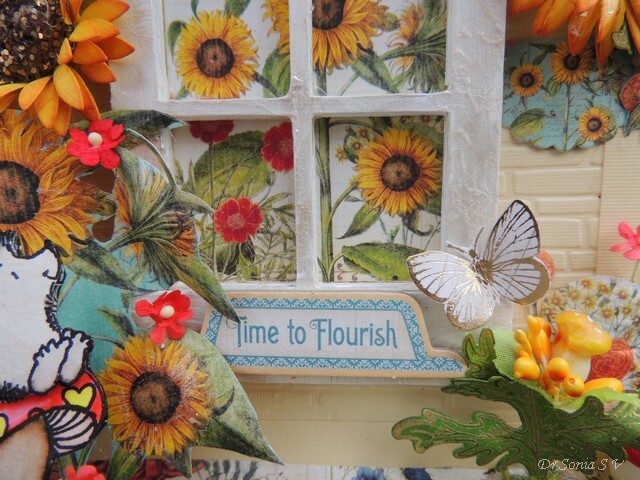 I used a Graphic 45 chipboard"time to flourish" on the base of my window...such an apt sentiment for this project wont you agree! 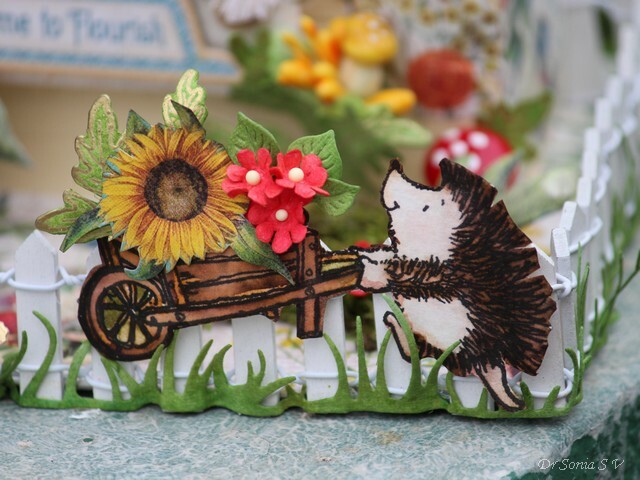 And bidding you adieu with the cutest image...an adorable hedgehog from Penny Black's Critters in love stamped and watercolored using Kuretake Zig Clean Color Real Brush Pens . Butterfly Challenge _ I have lots and lots of layers and also used the cream color. The gorgeous butterflies are in fact a winnings sent to me by dear Mrs A many moons back for winning the Butterfly Challenge !